Over 26 years of hard work and research of the Mustang GT/CS has been culminated into one complete book--that's raised awareness of this unique Mustang marque throughout the world! Since the release of this book in April, 2011, there are now far less copies available of this limited edition of 2,000 copies. Each specially numbered book is signed by The author! A tremendous surge of initial orders last Spring quickly depleted over half of this one-time printing, leaving only a few hundred copies available for sale. There are NO plans to reprint this book, and when they're gone -they're definately gone! If you've been wanting a copy, NOW is the time to get one, since this could be your last chance; especially during the upcoming Christmas Holiday Season. This book covers the original history of the inception of a Mustang created by Ford-- just for the California market in 1968, followed by the identification and restoration of the 1968 version (AND, YES! it includes Marti Auto Works production data for the 1968 GT/CS; by color, interior, engines, options, etc...it's all there!!). For Late Model GT/CS owners, a 24-page chapter, entitled "Repeat Performance" describes in great detail the revival of the GT/CS Mustang for the 2007 model year, beginning with concept models and development prototypes. See the CHAMP CAR World Series GT/CS Pace cars, AAI factory photos, GT/CS parts development, options lists, GT/CS promotion and advertising, detailed production numbers, Ford Racing parts listing, aftermarket items, and even side stripe installation specs (2007-09)! 2011 GT/CS specs and identification photos are included as well. You may wish to buy a second "investment copy", which will certainly gain in value over time (likely to be found on internet auction sites at much higher prices once they're quickly out of print). This book will most likely increase the value of your GT/CS, since automotive values are measured by their heritage, history, restoration and recognition--especially with Mustang's 50th Year Celebration beginning in early 2014! GT/CS owners have been surrounded at car shows and "disruptions" that have happened at Mustang Club meetings when owners bring this book along with their GT/CS. This book was created just for you--the GT/CS owner....to show the world just how Special your GT/CS truly is! Beautiful Hardbound Textured Black Cover w/ Chrome Foil impression of early and late model GT/CS stripe logos. Parts descriptions with every detail, assembly procedures & specifications. 1968 GT/CS Concourse Restoration info with paint codes and color illustrations for undercarriage and suspension. A 23 page GT/CS Registry with 1,350 cars & GT/CS owner car photos. Complete history of the 2007-09 and 2011 GT/CS . Detailed histories of Shelby's 1967-68 prototype coupes- "Little Red" and "The Green Hornet". 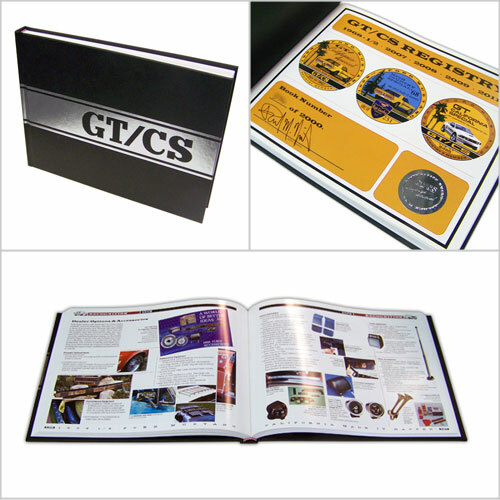 Mustang GT/CS (California Special) - Recognition Guide and Owner's Manual.